Today at the FPL we had two kids–and we had a grand time. Vivienne had a volunteer all to herself. Cole played every part that was not Queen Asia (that role was Vivienne’s). At the end of library he had the high honor of carrying her home in what she described as a “princess carry.” while she played dead. Kweli had his own volunteer too. Isaac ended up helping Kweli dig–Kweli has a genuine fascination with what can be found under the dirt. You may be thinking, what, no program? It was color day at the library and Kweli and I painted a pretty decent color wheel. We also had a table-sized mural going on which we each drew our favorite things and then figured out how to spell them and stenciled the letters on . Vivienne, at 5 sounded out Princess very well. Meanwhile, Miss Heather and CJ 1 tested out Da Vinci’s Vitruvian man drawing by having CJ 1 lie down in the street while Miss Heather drew the circle. By golly Da Vinci was onto something. 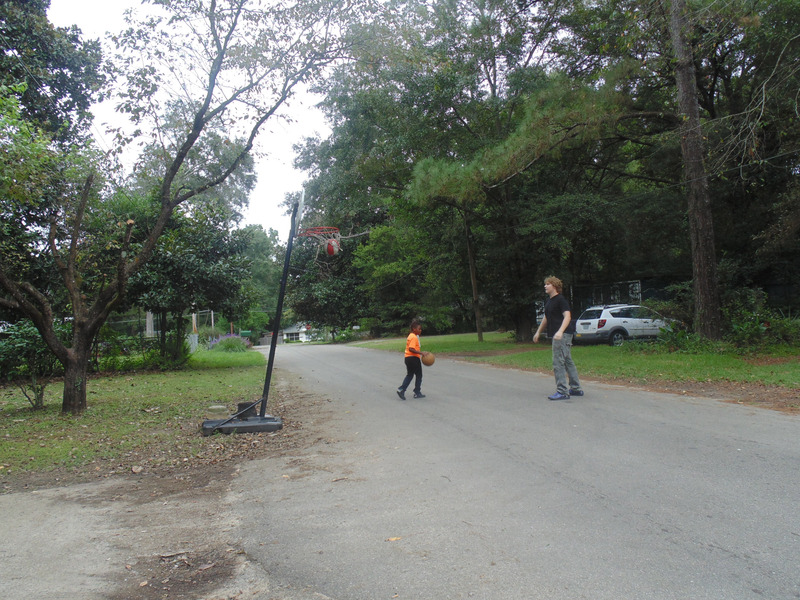 Mr. John took on one of the back rooms (always a losing proposition) and Hunter oversaw hooping in the street. It was a lot of fun–and there was more than enough cake to pass a big slab over the fence to the next door neighbors. I added an image of the good old Vitruvian man, then thought better of it–my goodness, the guy is nekkid–so I edited it out. Just google it. You’ll recognize the drawing. CJ 1 was much better dressed.